UPPER EAST SIDE — The world’s oldest crown is coming to New York City’s poshest neighborhood, but this headpiece wouldn’t fit in with the tiaras at Tiffany’s. The crown — a blackened metal ring topped with vultures and doors — is a relic from the Copper Age, which occurred about 6,000 years ago. It’s on display at the Institute for the Study of the Ancient World at New York University as part of a new exhibit that runs from Feb. 13 through June 8. “Masters of Fire: Copper Age Art from Israel” contains 157 items representing eight decades worth of archaeological discoveries from Israel, according to Jennifer Y. Chi, the institute's exhibitions director and chief curator. Many of the artifacts come from the Nahal Mishmar Hoard, a collection of 432 objects uncovered in a remote cave high above the Dead Sea in 1961. 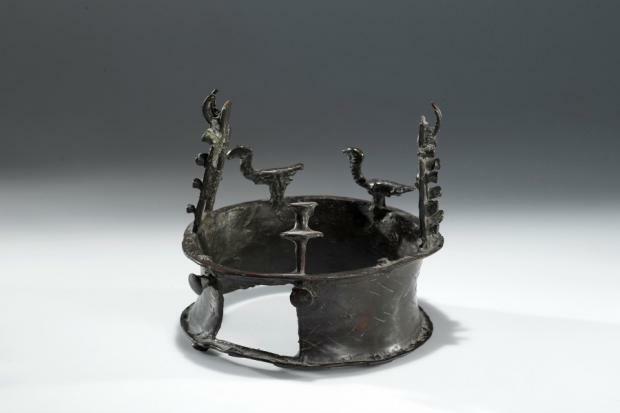 There is a scepter decorated with horned animals, a copper container designed to look like a woven basket and clay goblets and bowls. The Hoard was a defining discovery of the Copper Age, according to Chi, and tell a story about how early society was organized. "In order to have such exceptional objects, you have to have some sort of elite group that can afford to have them made," Chi said. "As one of the other curators said — it's like the original 1 percent." The exhibit also features objects from the Peqi’in Cave, another important discovery site. The most significant are eight house-shaped ossuaries, or burial containers for human skeletal remains. Some were designed to look like human faces or figures and all are decorated with red stripes or zigzag patterns. Archaeologists now know that these ossuaries held the bones of more than one person and that the vast majority were men. The crown, the most ornate of five on display, may also have played a part in burial ceremonies, Chi said. Some archaeologists speculate that the crown, with its symbols of vultures and doors, is a model of a structure where bodies were allowed to de-flesh before burial. "Masters of Fire" is the most comprehensive representation of Copper Age artifacts to be seen outside of Israel, according to Chi. To provide viewers with context for the displayed objects, the exhibit will also include large paintings that depict rituals from the Copper Period. "Our mission is to look outside of the traditional limits of the ancient world," Chi said. "Normally, you learn about Greece, Rome, Egypt and Mesopotamia. We want to see what happens when we move the focus to other regions." The Institute for the Study of the Ancient World is located at 15 E. 84th St., between Fifth and Madison avenues. Admission is free. Free guided tours are available on Friday evenings.